Teenagers Juan Pablo and Rocio are neighbors and best friends, two young people who have spent their lives together, each raised by a grandparent in a quiet butterfly sanctuary in the tiny village of El Rosario in the State of Michoacán in Mexico. The two are not your ordinary small-town Mexican teens: they are budding scientists who are bilingual and homeschooled, well-read in both English and Spanish and often communicate to each other in English via their iPads. They spend a lot of time together learning from JP’s abuela, who is the town’s curandera, medical doctor, and all-purpose wise woman. JP is a brilliant classical violinist and, having taken online courses at the Khan Academy with Rocio, he’s a math whiz besides. The teens’ main passion, besides reading and watching movies on TV as well as The Discovery Channel and Animal Planet, is working for the butterflies. JP’s elderly abuela is dying. JP’s mother had died while giving birth to him, Rocio’s mom is working in Arizona and her brother is attending medical school in the US, and neither of their fathers is present (although JP’s abuela has told him that his father’s name is “Juan Laves”). Oh, and Juan Pablo has green eyes. Which the author mentions often. Hold that thought. All hell breaks loose when a drug cartel invades and almost everyone leaves. In an attempt to protect Rocio who has been grabbed and is about to be raped, JP accidentally kills some of the narcotraficantes with his abuela’s poison. His abuela dies shortly thereafter, followed by Rocio’s abuelo. Pursued by agents of the murderous cartel, the teens hurriedly bury JP’s abuela in the butterfly meadow and are forced to leave Rocio’s abuelo’s body to the cartel. JP takes desperate measures to save his dear friend while they are on the run, following the butterflies north to Pacific Grove, California where, his abuela had told him with her dying breath, someone would be waiting for him. Guided by the butterflies and his now deceased abuela’s wisdom, the two cross the Mexican desert, travel by water, encounter the generosity of strangers, temporarily split up, and deal with the violence of the drug traffickers and issues of poverty, immigration, and human rights. Unfortunately, Juan Pablo & the Butterflies is littered with, among other things, highly unlikely events; each signaled by the arrival of a butterfly, who guides JP, showing him where to go and what to do. (The butterflies, of course, embody the spirit of JP’s abuela, now residing with the “Sky People.”) Such events include, but are far from limited to, the sudden appearance of strangers—from wealthy tourists to poor agricultural workers—who arrive on the scene to save JP from catastrophe and provide a passport and birth certificate for Rocio; the opportunity for JP and Rocio to save a baby whale (while the youngster’s mother hovers nearby), who had become entangled in netting; and—as JP confronts his own inevitable death and hears his abuela’s wisdom about everyone’s being spirits having a physical experience here on earth—the sudden arrival of the cops and a SWAT Team (the “good guys”) to rescue him from the narcotraficantes' bounty hunter. And, while it’s appropriate to use Spanish for honorifics, such as “abuela,” or “curandera,” or names of words that might be lost in translation, the only terms in English used for Juan Pablo’s abuela are “old lady” and “old woman.” Although the literal translation, “vieja,” is a term of endearment, “old woman” and “old lady,” both of which the author uses a lot, are derogatory. Juan Pablo’s abuela is the local curandera, also referred to as a “medicine woman.” She’s an Indian woman and a practitioner of traditional medicine. And she graduated from medical school. Curanderas are trained, sometimes from childhood, in healing the body and spirit; indeed, curanderismo is something that requires lifelong dedication. Curanderas don’t just magically “heal” people; they work with people and with herbs and plants, to affect healing. There’s also an occasional curing that can’t be explained, and there are some things curanderas can’t do. But here, the author, by referring to this lifelong education and practice merely as “absorbing ancient wisdom,” diminishes all that goes into its study and practice. Abuela appears to be a shaman as well. She’s an all-in-one spiritual phenom, singularly embodying not only a whole culture’s metaphysics but also bits of other cultures—a mishmash of mythology and mysticism that the author invents. More questions: Where, how and from whom did Abuela learn her shamanism and curanderismo, which are two different studies? How and why did she become the embodiment of everything that’s noble and mystical? Yet, despite all of Abuela’s talents, she’s helpless because she doesn’t know of any medicine or magic that would save her community from the terrible plague of the drug traffickers. But. Abuela is a healer. It’s not a curandera’s job to stop corruption and lead the people in rising up and taking back their village. Many curanderas are gifted, but this thread is major cultural appropriation. And, despite her training in both traditional and “city” medicine, Abuela gets a lot of things wrong. Just before Rocio’s abuelo succumbs to a fatal heart attack, for instance, Abuela warns Rocio that her abuelo’s poor health is due to his bad eating habits: He needs to stop eating like a barn animal and start eating like a hummingbird or I fear even my medicine will fail, she warns. (p. 24) However. Hummingbirds are tremendous eaters. With the fastest metabolism on earth, 100 times that of an elephant, they eat as much as three times their body weight each day. They eat all the time. No medical practitioner who is treating an obese person in poor health would counsel him to eat like a hummingbird. The story takes place in the tiny village of El Rosario, in the State of Michoacán, next to the winter nesting grounds of millions of monarch butterflies. While butterflies have a place in Mexican literature (see Guadalupe García McCall’s beautiful Summer of the Mariposas, Lee & Low, 2012, http://decoloresreviews.blogspot.com/2015/07/summer-of-mariposas.html), the butterflies’ pretended cultural context here is appropriative. 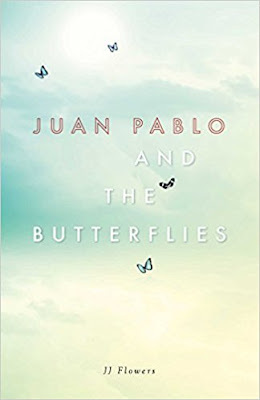 For instance, rather than instructing Juan Pablo and Rocio to follow the North Star in their escape, JP’s abuela advises them to follow the butterflies’ migration pattern, a major plot line. There are several El Rosarios in Mexico, including one in Baja, and another in the State of Sinaloa, the home of the Sinaloa Cartel, an international drug trafficking, organized crime syndicate that’s considered the most powerful drug trafficking organization in the world. Does the author not know that El Rosario is the name of where the Sinaloa Cartel lives? In at least two places, the author gets the basic geography wrong: “Milkweed fed the butterflies on their perilous journey from El Rosario to the great lands of North America.” (p. 13) And, “[e]very year, fewer of the colorful winged creatures returned to El Rosario, and this year, in alarmingly diminished numbers, they had left for North America early.” (p. 15) When refugees from Mexico flee to El Norte, they’re going to “the north.” Mexico is part of North America. Throughout, the author often and incorrectly uses “banditos” to mean “bandits.” “Banditos” is an Italian word for thieves or robbers who steal property, people who live outside the law. The Spanish word for “bandits” is “bandidos.” During the Mexican Revolution, the ruling classes and the press referred to the revolutionaries as “bandidos,” and in 1967, Frito-Lay created their racist icon, “Frito Bandito,” to sell their chips. Here, the author conflates the Italian term “banditos,” which was used by Frito-Lay to rhyme with “Fritos,” with the drug traffickers, whom she refers to as “narco-traffickers,” which is not a thing. The cartels are drug traffickers or, in Spanish, narcotraficantes. The cartels—the narcotraficantes—are far worse than “bandits.” Besides selling drugs, they recruit and bribe the local “leaders,” including mayors, judges, sheriffs, cops, and priests; and they murder—in the most vicious and gruesome ways possible—journalists and teachers and students who dare to challenge them. For everyone else, the choices are limited: stay and fight (and be likely to be tortured and murdered), flee to the US (and risk being arrested and sent back), or join the local narcotraficantes. (For an accurate picture of how the narcotraficantes wreak havoc in Mexican towns, see Phillippe Diederich’s excellent Playing for the Devil’s Fire (Cinco Puntos Press, 2016, http://decoloresreviews.blogspot.com/2016/05/playing-for-devils-fire.html). What does “normal mean” mean? In a moment’s inspiration, [JP] remembered once a Middle Eastern tourist had stood at the plaza, terrified by little Tajo. Tajo’s hair lifted and he barked uncertainly… (Abuela explains to JP that “dogs smell emotions the way we see emotions on faces” and that “Tajo was confused by the lady’s fear. ‘Why is the lady afraid of me?’ Tajo wonders.”) (p. 58). In one of JP’s escapes from the bounty hunter, he turns himself in to a cop by saying “the hardest words he could imagine: ‘I am Juan Pablo from El Rosario, Mexico, and I do not have the proper papers to be in America.’” (p. 160) He soon finds himself housed in what the author refers to as a “shelter,” in which he is “surrounded by a thousand desperate children.” (p. 161) When she discovers that JP speaks English, a grateful social worker immediately recruits him as a translator. It’s unbelievable, even in the context of this novel, that detention facilities—in which unaccompanied refugee children are warehoused while they’re being screened for asylum—would be called “shelters” and which would have no one on staff to communicate with the children. While the detention centers are horrible, there are translators. The author’s simplistic, formulaic, poorly conceived and abysmally written story disappears the realities behind the narcotraficantes and all those institutions that support them. Indeed, she chooses to ignore the important questions of the political and economic roles of the US and Mexico in the Mexican drug trade—and of the Mexican and American people on both sides of the border who buy and sell illicit drugs. She also chooses to ignore the thousands of undocumented immigrants who die struggling to get to El Norte, and the fates of the thousands of terrified, unaccompanied refugee children languishing in detention centers before being sent back. In Juan Pablo & the Butterflies, the narcotraficantes are just a gang of murderous “banditos.” They’re the “Mexican bad guys” who just happen to invade a small Mexican village and take over. And, of course, it’s up to Juan Pablo, almost singlehandedly, to stop them—or to escape. Not recommended. (Update, 8/17/17): Another term the author frequently uses is “droguistas,” which, in context, is supposed to mean “drug traffickers.” Aside from the unreliable-at-best Google Translate (which defines “droguistas” as “druggists”), I could not find the term anywhere and assumed that it was either Caló for “druggies,” or that it didn’t exist. None of my Spanish-speaking colleagues had heard of it either, but one told me that she thought it sounded like “drogadistas,” Spanish for “drug addicts.” Another, who is fluent in Tex-Mex, told me that “drug addicts” in Caló was “drogadicta/os.” Finally, a definitive answer: “Droguistas” is not a Spanish or Caló term for “drug traffickers,” “drug addicts,” or anything else. It. Doesn’t. Exist. Rather, street drug dealers are “tiradores,” from “tirador,” to toss around; and “narcotraficantes” (a term I had referred to in the body of the review) are high-level drug traffickers, such as the cartel bosses. Míl gracias a mis colegas, María Cárdenas, Judy Zalazar Drummond, and Lyn Miller-Lachmann. "after the Aztecs and before the Spaniards" Wow. Just wow. Yeah, the Post-Aztec Pre-Spanish Old Indian Trail. Nope. Canada, the United States, and Mexico make up the continent of North America. Central America, which is bordered by Mexico to the north, consists of Belize, Costa Rica, El Salvador, Guatemala, Honduras, Nicaragua, and Panama. why do these people get published??? Honestly, it's an assault to our students we deserve better literature for sure. How do these books even get published, smh! Our students deserve better literature than this garbage. I read this review and scroll back to check the publisher which is Simon and Schuster. What a shame. I always hated children blurting out wrong information in my classroom. Other children would use it to answer questions on the test. It is hard to cancel out bad information. I have a question. How did Simon & Schuster end up publishing this book without editing it after the author submitted her draft? Aren't those books-without-any-or-much-editing usually published by an independent publisher, even if they later end up getting a deal with a Big Publisher? Examples: Save the Pearls: Revealing Eden (another racist book); Eragon (not racist); and some others I can't think of right now. Thanks for writing, Sam. Your guess is as good as mine. The author says she wrote JUAN PABLO in two months, which is a tipoff, and she DID have an editor (Jackie Mitchard of Merit Press, S&S). The major reviewers all liked the book. Of them, only two mentioned "some Spanish grammatical errors" (SLJ) and "periodic misuse of Spanish" (Kirkus). And two used incorrect terms in their reviews: "narcotraffickers" (Kirkus), and "narco-traffickers" and "droguistas" (YABooks.Central.com). By the way, that phony word..."droguista"...there is a similar, although apparently obsolete, word in Spanish, "droguísta", which has been used since at least 1809 (see here: https://www.google.com/search?q=drogu%C3%ADsta&source=lnms&tbm=bks&biw=1366&bih=638), but it seems to have had a limited range of usage in the Spanish-speaking world, and it did not simply mean "druggist". It also meant "cheat" or "impostor", and maybe that's why it fell out of use in the early 20th century. And, of course, it didn't mean "druggie".